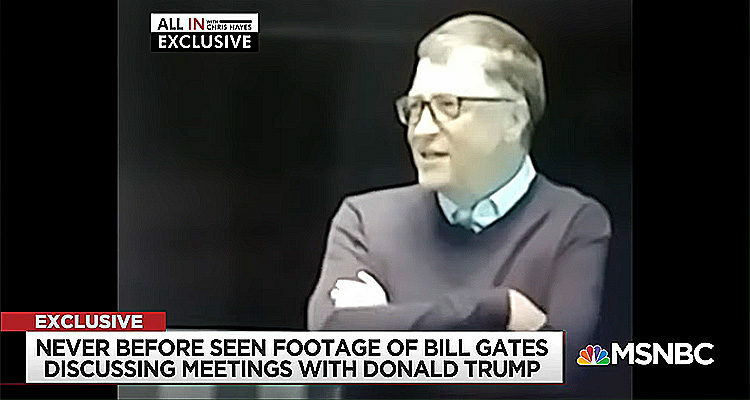 Bill Gates talks about avoiding Trump, bizarre questions about vaccines, and Trump-style stunts in exclusive video obtained by MSNBC. Thursday night, MSNBC host Chris Hayes aired never-seen-before footage of Bill Gates talking about two meetings he had with Trump since the election, one at Trump tower in December 2016 during the presidential transition and another at the White House in March 2017. Chris Hayes explained that the footage was taken at a recent Gates Foundation event where the Microsoft founder took questions from the crowd. Gate began by talking about the fact that, shortly before the election, he and Trump were at the same place at the same time but he avoided meeting him. “I never met Trump before he was elected,” Gates explained. “There was a thing during the election where he and I were at the same place and I avoided him,” Gates added – to the laughter of the audience. Continuing, he said that he met with Trump twice since the election and recounted being frightened by Trump’s knowledge of his daughter Jennifer’s appearance [now 22-years-old]. So when I first talked him it was actually scary how much he knew about my daughter’s appearance. [laughter] But, Melinda didn’t like that too well. Continuing, Gates told the audience that Trump asked about vaccines and the difference between HPV and HIV.